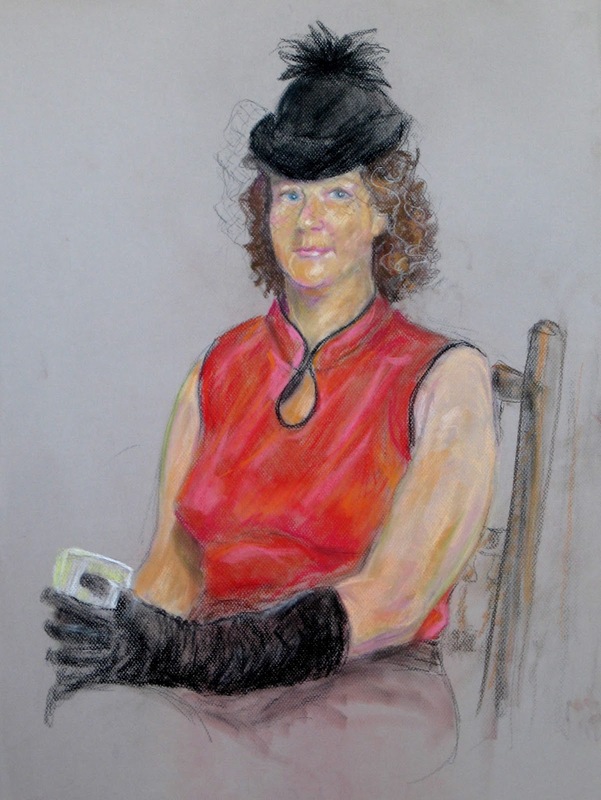 The blog has nothing to do with the above painting- it is there because it is one that I did at the October figure painting workshop. It was mostly done in about three hours from a model - and then re-visited part of the final day when we went back to look at our work and decided what needed adjustment. The background is entirely from the imagination as there were actually other painters standing at their easels. I used it to emphasize where the main source of light was and to work in harmony with the colours of the model and her clothing. What has been interesting me lately has been the attention paid to Lawren Harris because of the exhibition of his works, arranged by actor and collector Steve Martin, in Los Angeles. Also, the record-breaking sale price of one of his paintings attracted much press. I was interested to see Russell Smith writing in the Globe and Mail that he personally does not like Harris' work at all. "I find his stylized, glowing, bulbous glacier-scapes to look a lot like children's-book illustration. Very good children's-book illustration, sure- pair them up with a nice story about a dog and a seal and you'd get yourself a Caldecott Medal." I thought that was quite funny. Nobody wrote in demanding Smith's head - which was interesting in itself as so many of us grew up with the silk screen prints of Group of Seven works in school hallways. Apparently this silk-screen proliferation of Canadian landscape was part of the government drumming up Canadian patriotism for World War II. I also grew up seeing originals in the Vancouver Art Gallery when I attended Saturday Morning Art Classes there. On a personal level, I like some of Harris' earlier works best - street scenes mainly. The mountains tend to be a little bleak for my choice- maybe a little too stylized. Again, however, it is personal choice and the Group of Seven will probably always have a special appeal for most Canadians. We each should feel free to assess how we really feel and respond to the paintings - which isn't easy when the legends are so much a part of our experience in Canada. I'm reading - in bits because there is so much to it- "Portraits- John Berger on Artists", edited by Tom Overton. John Berger is one of the world's most celebrated art writers and the book is composed of many of his reviews and other writings. He wrote a review of a show of Henry Moore's sculptures in which he said, among other things " a life-size "King and Queen", with crowns like jug handles to their heads, bodies that are scooped out, winded, and smacked flat like kippers..." Then he recalls in a piece written later, "Moore's work was uneven. He produced, in my opinion, his weakest sculptures during the period when his work was most in demand and most critically unquestioned. I remember that towards the end of the fifties, when I had the temerity to write critically about his latest work, I very nearly lost my job on the "New Statesman". I was considered a national traitor!" -and so we see that it is not easy to take a fresh look at venerated art. The other side to that, of course, is that when certain art gets the spotlight, collectors want it for the signature- and, often, how much it cost. Art and the art market are two different things. This is a very short blog but I just wanted to show the entire painting of which just a slice was shown on my December newsletter - so here it is- the house off Commercial Drive done on a plein-aire day. If anyone is nt on my newsletter list and wants to be, e-mail me at lorainewellman@shaw.ca . It is just a short e-mail with a picture every month and usually a notice of upcoming art events.- cheers! I have a new issue of the magazine Creativ. You can find it at Chapters, select International News locations and McNally Robinson - which is not in Vancouver. The front and back covers, above, show the free-thinking approach. 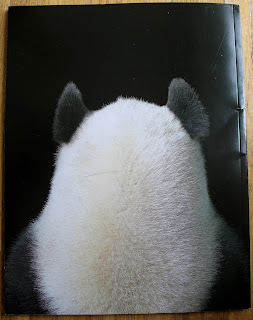 The front cover is even slightly molded- while the back has the back view of the panda! Inside there is some of the most beautiful photography you will see anywhere and lots of inspiring pieces about people who asked "what if ?" and came up with something definitely out of the ordinary. There is: a French photographer who reimagined superheroes in the style of old Flemish paintings, fashion forward pants that come with the stories behind the block prints, a surprisingly beautiful hand-cut sculpture of a bacterium, an unusual story about a physicist who says "Science is the journey of human intention; it is the process of risking it all for the chance of expanding what it means to be human", eco-playgrounds, an amazing painting of Manhattan - and that's not all. 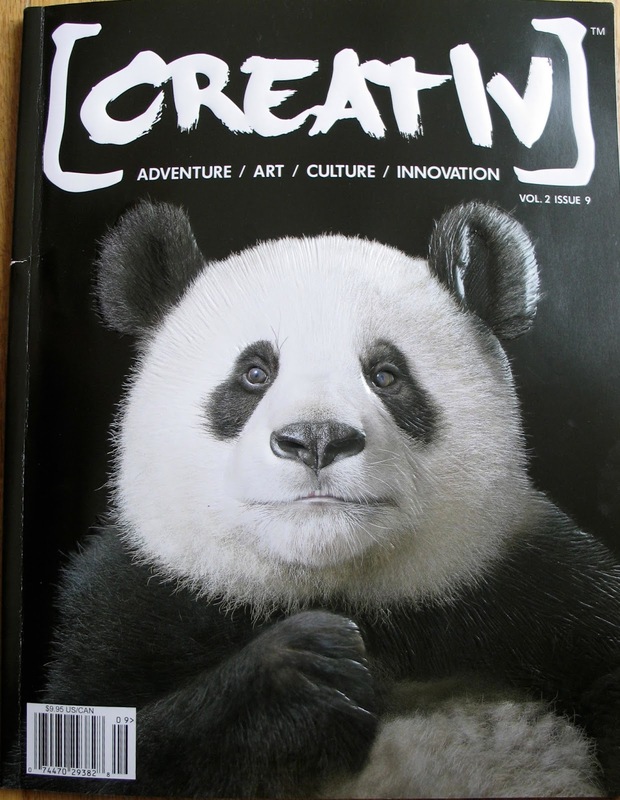 Both inspiring and thought-provoking, this tribute to creativity is a good one for artists and all creative thinkers to ponder. Hopefully, we can all rise to new levels of creativity. I just posted this painting on my September newsletter . It is called "Love for Three Oranges" but there wasn't room for the oranges in the newsletter space - so here they are. I first heard that music when I was at Art School and the title has stayed with me. I thought it would be a good warm painting for a fall newsletter. If anyone reading this doesn't get my newsletter (very short, a picture each time) just e-mail me at lorainewellman@shaw.ca and I will add you to my list. The main news on my newsletter is that the Grand Prix of Art Steveston is this Saturday. There will be around 100 painters painting all around Steveston and Britannia Heritage Shipyards. The tricky thing is, until we pull a slip of paper with the location, we have no idea just where we will be painting. Then we have three hours to complete a painting which will be turned in for judging. I hope I get an interesting location that is different from where I have been before. Plein aire painting started just before the time of the Impressionists. Before then, paint had to be ground and mixed as it was to be used - strictly an indoor job. Then paints became available ready to use in tubes. Of course, the artist still adds a mixer-medium. For oils, it used to be turpentine and an oil- probably linseed. This is a bit smelly and probably a bit toxic but one whiff does remind me of Art School ! Now oil painters use a different non-toxic, non-smelly medium. Some oils are now even compatible with water. Acrylic paints, mixed with polymer plastic instead of oil, became available around 1940 and have proven their durability. 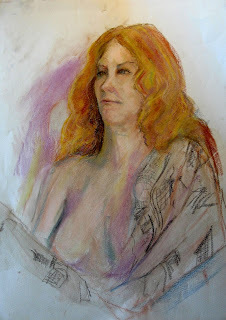 The actual colours - or pigments- are the same in both oils and acrylics - and, for that matter, pastels and watercolours. Acrylics have the advantage of being a material than can be cleaned up with water. They maintain their flexibility so paintings don't crack. They also dry fast - and the artist keeps brushes in water because of this. Drying fast has both advantages and disadvantages. Now, mediums have been developed to slow down the drying so it is not awkwardly fast in the outdoors. I will be using a retarder gel when I am painting in the Grand Prix. It slows down drying enough to give better control for softer edges where I want them. Another advantage to acrylics is that the finished painting needs no varnishing and can even be wiped off. I recommend them for kitchen paintings especially. Needless to say, artists have great discussions about the advantages and disadvantages of oils, acrylics, watercolours and pastels. My feeling is that artists usually find the medium that appeals to them the most and with which they are most comfortable. My personal choice is acrylics - a modern paint for a modern world. 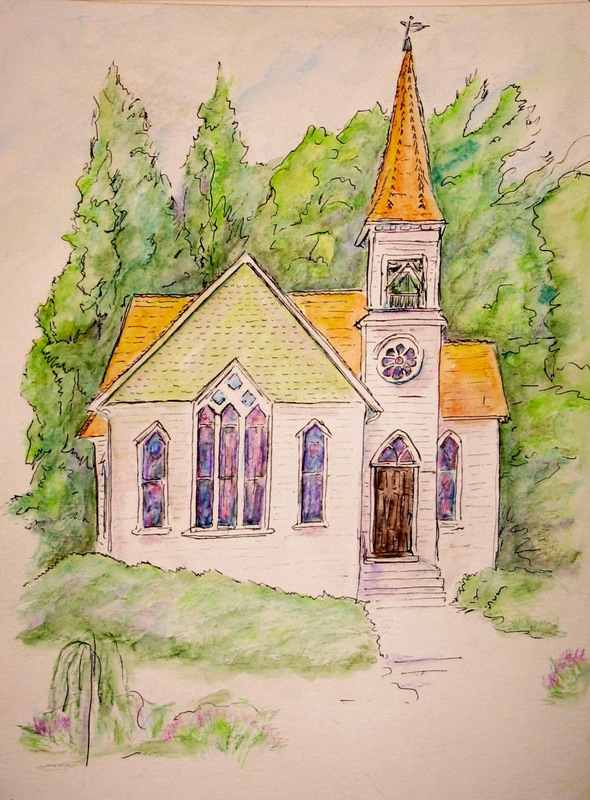 When I was a young teenager, I had summer painting lessons in Stanley Park with Peter Aspell. I went downtown on the interurban tram. Since it kept very regular time, it was possible for my friend to get on the same tram at 57th, further along the line. We could have paid (I think a nickel) to transfer to a bus that would have taken us to the entrance to the park, but we usually walked so we could spend that "saved" money on "love comics". We did some oil painting on paper that we treated with gelatine and painted "plein air" with Peter, who was a well-known painter. Part of my early art experiences. All this was before the more organized "Painting in the Park" classes organized by community centres. 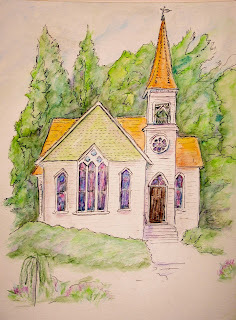 Yesterday, the Men in Hats met at Minoru Chapel for our Tuesday painting session. Several worked in oils or acrylics but I decided to keep it simple and just practice my drawing with a pen and ink drawing. I then added watercolour pencils to it and dampened the paper with pens that hold water in the cartridges. So, it was just a practice session with no outstanding results but a nice time out with friends that resulted in this piece. I need it for a reference for a project I am working on so it will prove useful. So, a different medium and a non-instructional session - but there I am more than a few years along - still "painting in the park". Here is the painting from the Finn Slough show - just because I hadn't posted it before. I have been out with "Men in Hats" but mostly just working in pen and ink and watercolour pencils. Last week, we were out in Burnaby and I went to have a look at the Burnaby Village Museum and the old carousel. The carousel is 103 years old and is now under cover, inside. When it was first there, it was outside ... a bit better for photography, perhaps. I did take a few photos and I may work them into something during the winter but there was no way to set up and paint on site.... so nothing new to show. The carousel used to be out at the PNE so it is the one I rode on back in my youth. Interestingly, they have given in a new hardwood floor. The wood came from the old B.C. Women's prison gymnasium. An odd combination. Does the wood hold memories? I also wonder what tales the horses of the merry-go-round could tell. We went to look at one of the old buildings which was a log cabin where a family of three had lived. There was a loft where maybe the child slept - although the heat would have been from the stove in the downstairs. A galvanized tub hung on the wall for the Saturday night bath. We were talking about that at lunch-time and decided that it was traditional here for the mother to go first but, apparently in other cultures, she may be the last! When I was in art school, one exam painting was of a model in a bathtub. We were raised up above the model area so we could all look down. It was like something from an Impressionist painting- green-tinted tub, bouquet of lilacs, Persian-style carpet. There was actual water in the tub....not sure what that did to the model's skin after a few hours! The young fellows in the class were quick to volunteer to top up the water with hotter water every now and then. 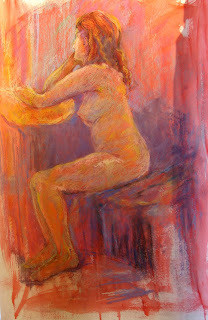 It would be fun to have an old tub now for Life Drawing on occasion - but I think we'd just let the model sit in it dry. Then again, our storage is very limited so we have very few props- and no way to be raised up on risers. Ah, life was fun then. Labels: Burnaby Village museum, does wood hold memories?. old bathtubs, Finn Slough art show, Men in Hats, model in a bathtub., old carousel. My "Spices" painting is another one currently showing at Hycroft - shown above and then shown hanging in the hall-gallery with the Rudbeckias, "Ready for the Run" and "Sandpiper Time". Although it is a private club (for women graduates of universities around the world) and not generally open to the public, you can arrange to see the show by phoning the office at 604-731-4661. The reception was well-attended and very nicely done with it all taking place out on the terrace on a beautiful warm evening. Right now, the Men in Hats are out plein air painting every Tuesday. There is some really nice work being done - but not by me right now. I haven't really "clicked" on anything. One time I was not happy with my acrylics drying up so quickly - so I just played with pen and ink and watercolour pencils last time. The results were not great! Still- there is the need to persevere and try to accomplish something worthwhile. It is nice just to be out with the group, talk art over lunch, and be in the fresh air. We are fortunate to have such a number of places where we can go to paint. I'm currently re-reading one of my favourite inspirational art books--"Creative Authenticity- 16 Principles to Clarify and Deepen your Artistic Vision"- by Ian Roberts. The first principle si Searching for Beauty. Ian says the book is not for those who would like to create but are too timid to get started- it is "a book for people who are in the thick of the creative struggle." He says "interestingly, we have come to the point in the contemporary art world where beauty is suspect as an aim in art." He goes on to explain that he doesn't mean pretty or sweet and that a great, powerful, beautiful painting - Goya's "The Third of May 1808" can also be horrifying. It is moving. I love where Ian trashes "the technology of the media as the vehicle of art, in which the means of communication alone is considered relevant, even devoid of any content". He talks of videos that go on and on leading nowhere. That reminded me of one I saw recently - in an art gallery--it was as if it was termed "artistic" because it was lousy photography with no point. "Life cannot be lived well without standards . Art, as a part of our life, would obviously seem to benefit from standards as well...... I think new standards of meaningfulness in art are resurfacing. Which is where authenticity comes in. Standards that are transformative, that will last, will have to come from a deep, quiet harbor of spirit if they are to anchor us today." This book is one that makes an artist question the process and really think about directions and what the artist is trying to express. We all need to work on our own growth and our authenticity so that our work will matter. The drawing is a pastel of Yui in a casual kimono. I tried to capture her beauty and grace. This was a long pose at Life Drawing and is posted in on Pinterest on my Life Drawing folio. I like life drawing because it is always a challenge to capture the beauty of the human figure - even when not necessarily what modern conventions would call "beauty." There is a beautiful person within and I want to be "authentic" in showing that. I'm currently trying to move in a slightly different direction in some work. This piece is more conventionally realistic than some things I am trying -although I elongated her a little bit to stress the quiet elegance. I've been working away on these for ages and finally got them all done and varnished. the idea is that they are store owners from a shopping mall, circa 1950's. 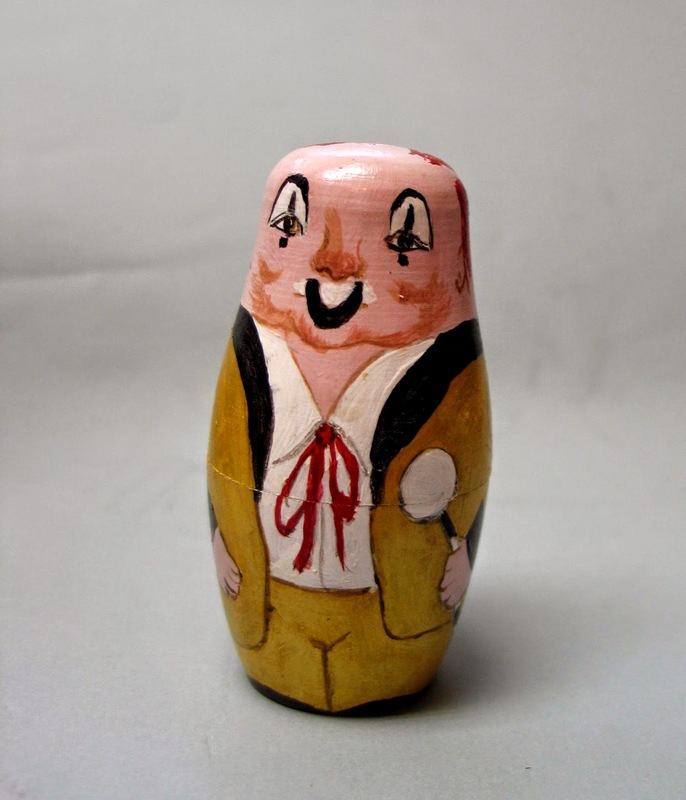 They were painted from a set of blanks that were made in Russia. I gessoed the blanks and painted them in acrylics. The outside one has an added hat,nose, eyebrows and mustache as well as an arm extension and hands to hold sausages. The others have to fit inside each other, so are all just painted. Mac of Mac's Meats is the outside doll and wears what used to be the traditional butcher's straw hat and striped apron. 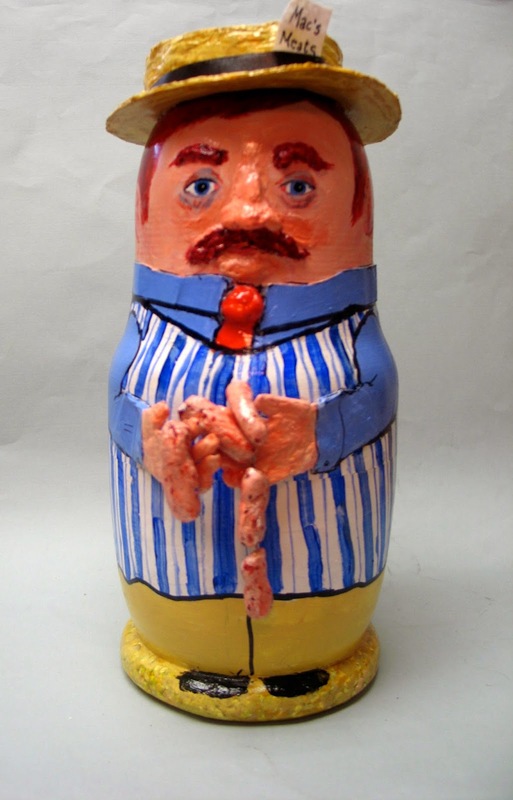 He holds sausages which were made from acrylic molding paste. 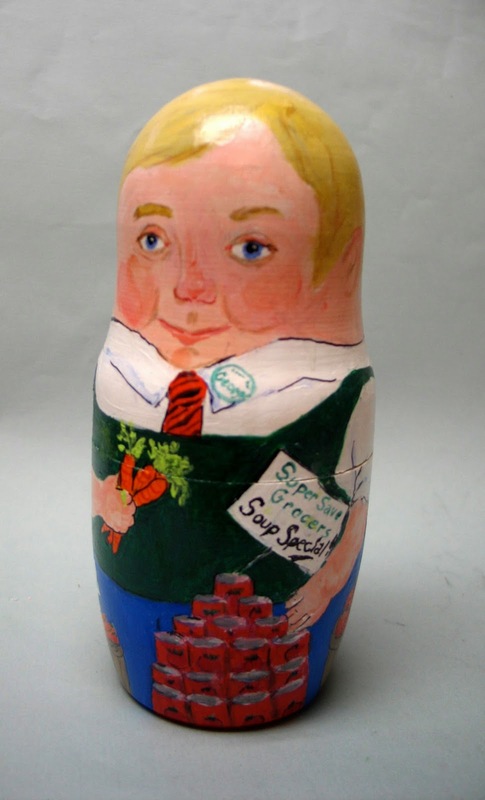 The second doll is George of Super Save Grocery. He stands beside a display of sale-priced tomato soup and holds organic carrots from a bushel basket. Obviously a man ahead of his time featuring organic produce ! - but, besides a bin of apples, he also has a bin of candy bars. 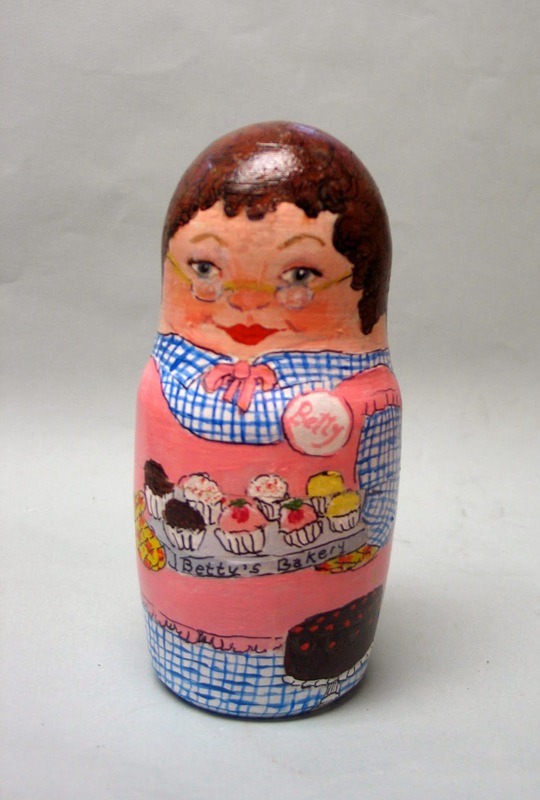 The third doll is Betty of Betty's Bakery. She wears a gingham dress and a pink apron with a large bow at the back. She has quilted oven mitts on her hands and displays a tray of cupcakes and a chocolate cake with cherries on it. On the other side, she has a tiered display of cookies. The final four smaller dolls are: Joe of Joe's Hardware. He is carrying a hammer and displays a variety of goods such as grass seed and bone meal, a broom and shovel, nails, screws and caulking. A practical man ready to help out with advice, he is dressed practically in a plaid shirt and blue jeans. Next is Pat of Pat's Pharmacy, looking professional in her white jacket while carrying a prescription in one hand and shampoo in the other. On the other side there is a display of toothpaste as well as one of magazines. Then next is Amy of Amy's Pet Foods, bird cage in hand while one cat is on her shoulder and another is also gazing at the food dish. A large bag of dog food is on the other side. Last is Barbara of Barbara's Beauty Salon - holding scissors and shampoo while a display of nail polish is on the other side. She is smartly dressed in black and displays her gorgeously coloured tresses. ART MAKING is indulged, but rarely rewarded"
Later he says "Step outside the arts community, and the separation of art from daily life is so complete that many people rarely give even a passing thought to the value of art in their lives." I think, alas, that he is probably right. It is hard to know how to keep presenting art to make people realize its importance. Politicians like to talk up the arts - and then give main support to sports! I think one thing that would help is free admission to art galleries. There is a fairly hefty fee for Vancouver Art Gallery and I now hear that it costs $20 to go to the Ontario Art Gallery -plus $25 more if you want to see the current featured exhibit of Basquiat! Not too many people are going to take the family to that. In London, the National Gallery is free. It would certainly help encourage people to take a look at the offerings if they weren't charged for entering. In the meantime, our art community in Richmond keeps trying to make a difference. This "Afternoon Class" painting was one of a ballet series I did. I liked the sun gleaming on the polished floors and the contrast of the instructor in black while almost all the students are in pastels. Too bad the instructor did not have a big stick and then it would have been like Degas' painting with the instructor. It has now been framed and will be going to Richmond Hospital to bring a little more art on the walls. We try. Today is the first Sunday in February and there will be some special clown services in some churches - one takes place in Hackney, London. 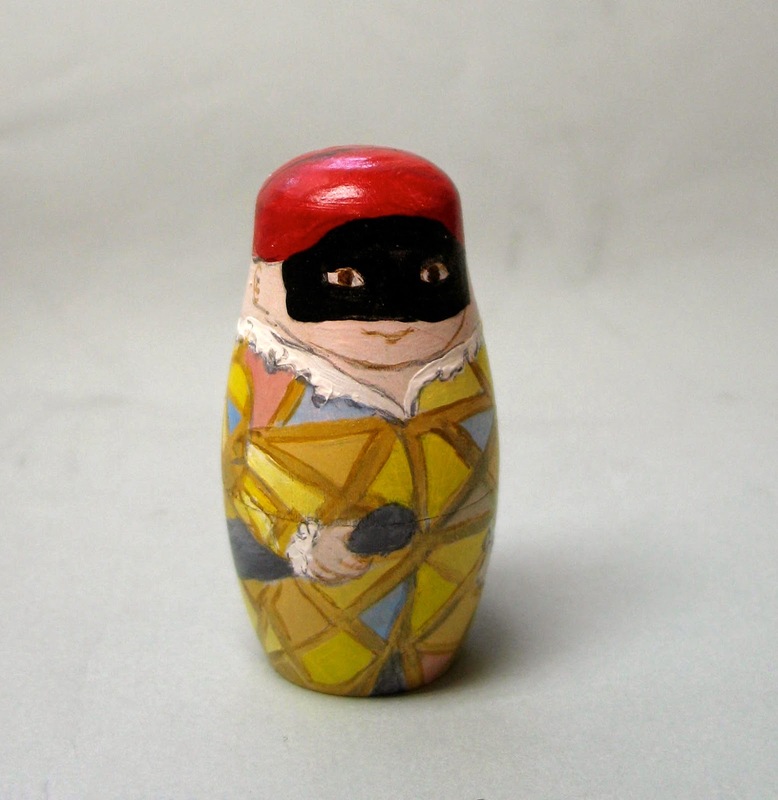 Usually, it is dedicated to Joseph Grimaldi - the outside nesting doll in my last post. Who knew? 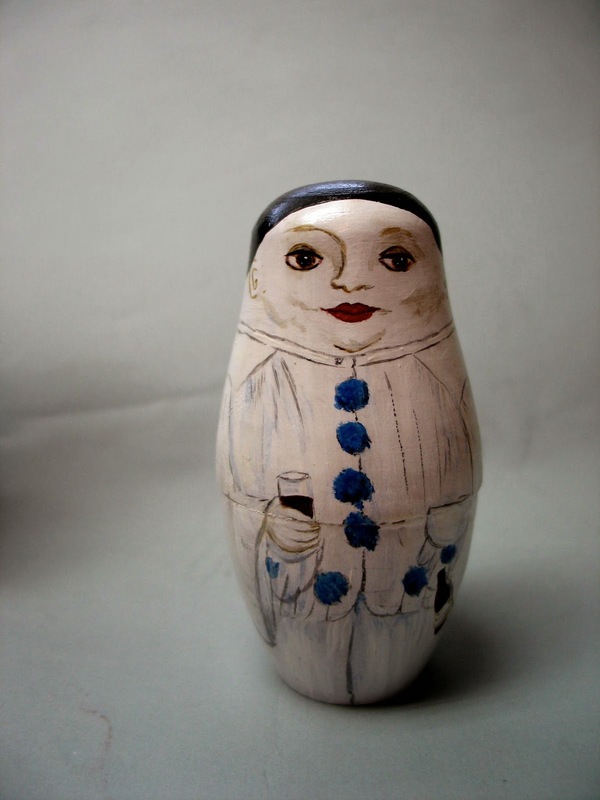 This is a set of nesting dolls I made in 1993 by painting on a blank set. The first Sunday in February, coming up in a few days, is the traditional time for a church service with clowns in some locations. While there is some "clowning", it is also a memorial service for clowns who have died the previous year. One service is held in Hackney, London. 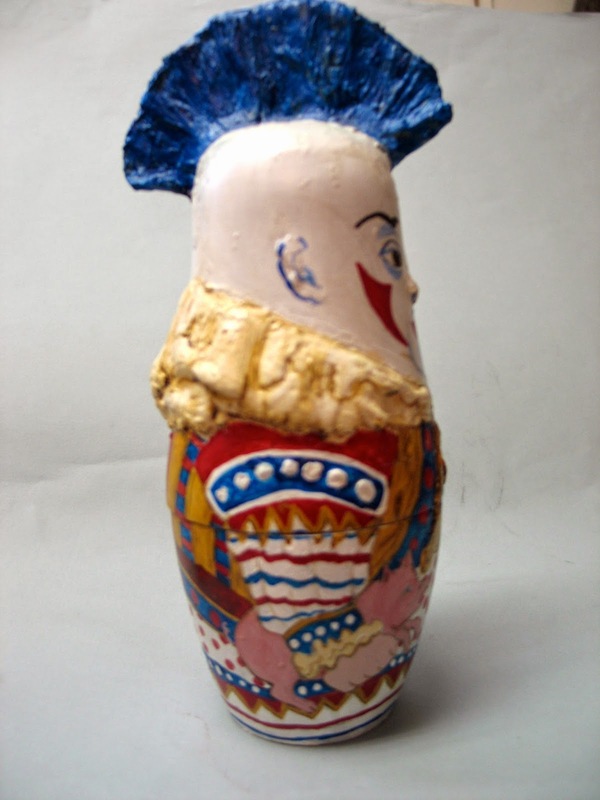 The largest doll in this set represents Joseph Grimaldi, Dec.18,1778- May 31, 1837, considered the godfather of clowns. Offering comic relief during the Napoleonic Wars, he expanded the role of "Clown" in English pantomimes and created a lot of the physical humour we associate with clowning. He satirized contemporary British life and made comic mockery of fashion absurdities - which sounds a lot like today's stand-up comics. It seems he may have invented the modern-day male haircut as well as a penchant for unusual hair colouring. The next clown represents Jean-Gaspard Debureau ( 1796-1846) who took the traditional white-faced clown, Pierrot, from Comedie-Italienne to greater fame. A white-faced clown is a sad clown and Pierrot loses Columbine to Harlequin. Jean-Gaspard changed the usual tall white hat to a black skull-cap. He helped create a lot of interest in clowns in general and with Pierrot in particular with artists of the time - including Cezanne. Coco is an English clown made famous by Nicolai Poliakoff (1900-1974). Coco was an "auguste" which is a type of clown who is supposed to be a bit stupid and always gets teased and has buckets of water thrown over him and custard pies slapped on his face. Coco had a serious side to his fooling around, however, and toured schools promoting road safety. That walking stick he carries is a Bolesha Beacon used at school crossings. He was awarded an OBE by the Queen for his work. The next clown is Tom Eller as Harlequin. I believe he was an American clown and there is a poster of him that often appears on E-bay. However, I have lost my notes as to why I selected him (hey it was 1993, I've forgotten!) - but he must have been in a book of clowns at the time. The colours are what his costume was - although we often think of Harlequin in brighter shades. 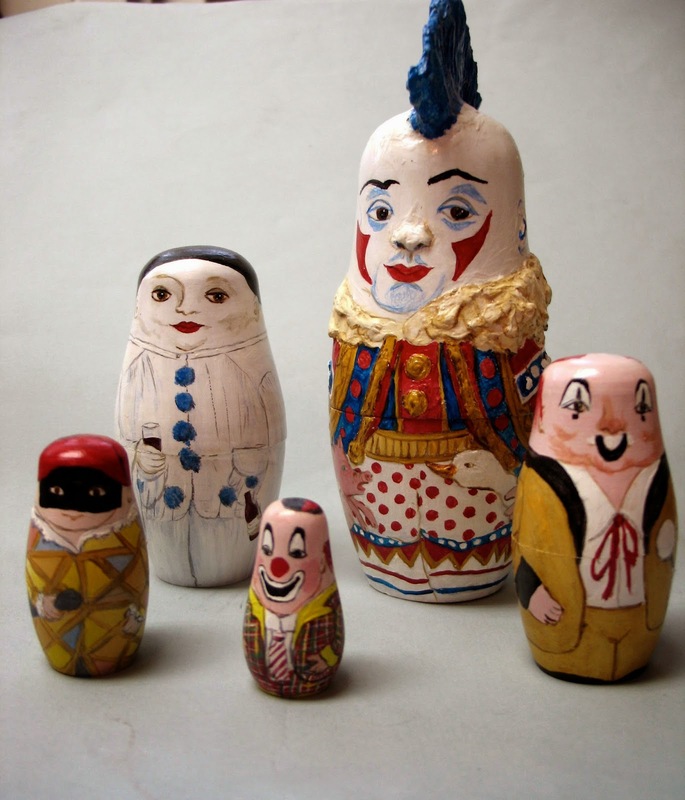 The smallest one is Lou Jacobs (jan1, 1903- Sept 13, 1992) the Famous American clown from Ringling Bros. and Barnum and Bailey. He appeared with such well-known clowns as Emmett Kelly but later as an instructor at Clown College helped make the transition to modern clowning. 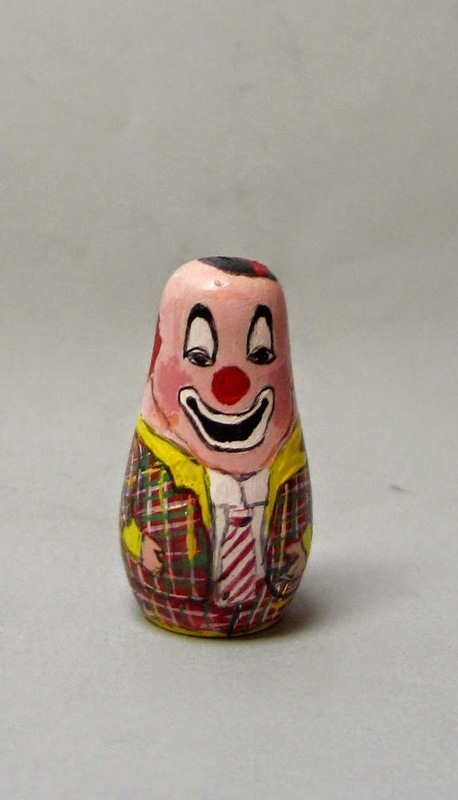 An Auguste clown, he popularized the clown car and was originator of the rubber ball nose. He was also the first living person to have his portrait on an American stamp. This is a painting that I did of the tall (seven feet!) red lilies growing in my back garden. I was thinking of Rousseau and his paintings from the conservatory - some with jungle animals. To enhance the idea, there is a little black cat face peeking out in the bottom - you can just make out the eyes and the tail is to the left - but it doesn't show as well in a photograph. At any rate - it is sort of a "Richmond jungle" painting. Sometimes it is fun to play and sneak something unexpected or not too immediately obvious into a painting. I did a Granville Island one quite awhile ago that has since gone on to another home. There is a dog just disappearing around the back of one building - but no-one has ever commented on that! Right now I'm taking a break from the serious fish-boat painting that was quite a challenge. I'll post it in a bit. I'm working on a 10x10 for next November for GuessWho? I had fun when I did "22 Owls" for GuessWho? a couple of years ago, so now I'm doing a lot of black cats in a "Black Cat Neighbourhood " and it is fun. I need to use some small brushes to paint the little faces looking out of windows. Picasso said it took a lot to get back to seeing like a child again. I don't know if I've got there, but I'm having fun playing. More thoughts on the "unheralded"
I like to read the essays in the weekday Globe and Mail. Today's was called "A brush with Mr.Williams" and was about a painting that caught the author's eye in a second-hand store. Although it was signed, no information could be found about the artist until some fifteen years later, presumably with the expansion of content on the internet, a detailed obituary was located. The artist, Norman Davies Williams had trained in England and emigrated to Brandon in 1948. the obituary writer noted . "He worked for the joy of working while his wife, Doone, brought home the pay cheque- an arrangement precisely as they both wanted it." Apparently he never entered competitions or exhibited. The art director of the local gallery wrote to the essayist, "Unfortunately, it is the sad life of an artist that talent doesn't always mean a living wage or long lasting fame. I always remind people that an artwork is valuable if it speaks to you in some way, regardless of its fame or value." There are a lot of good artists around today that are not widely recognized but whose works would bring pleasure if they hung in a home. Maybe some will become the subjects of future "Unheralded Artists" books - or have someone scrambling to find more about the artist of a work they have just found. But we would love to see more action for living artists. We were talking the other day about the need to have people realize that paintings make great gifts and that many can be found with just a little looking. People don't even have to wait for exhibits or open studios- checking on a site like Richmond Artists Guild produces a lot of names to follow up. Most artists are only too happy to give a private viewing and the collector can find the painting that truly does speak to him or her. The painting above, "The Old Conservatory" is a painting I did awhile back. Some people totally loved it, others, not. I liked the mood and the fact that you don't notice the old lady quietly reading the paper and enjoying the peace of the freshly watered conservatory. Richmond Hospital is doing some redecorating and was interested in some paintings . On a hunch, I included this one in an assortment. The Director of the Foundation really liked this one and said, "This painting is so serene and beautiful. We would love to find a home for it in the hospital and create a calming environment for patients and their loved ones." I delivered it today so it is one more painting out into the world.